With a press release published a few minutes ago, Apple announced major changes in the structure of the company. The big news is that SVP of iOS Software Scott Forstall will be leaving Apple in 2013, with SVP of Industrial Design Jony Ive taking over to "provide leadership and direction for Human Interface (HI) across the company". Forstall will stay on as an "advisor" to CEO Tim Cook in the meantime; Forstall joined Apple in 1997 coming from NeXT, and he was later promoted to Senior Vice President in 2003. Additionally, head of Services Eddy Cue will take over responsibilities for Maps and Siri, and John Browett, Apple's head of Retail, will be leaving the company as well. 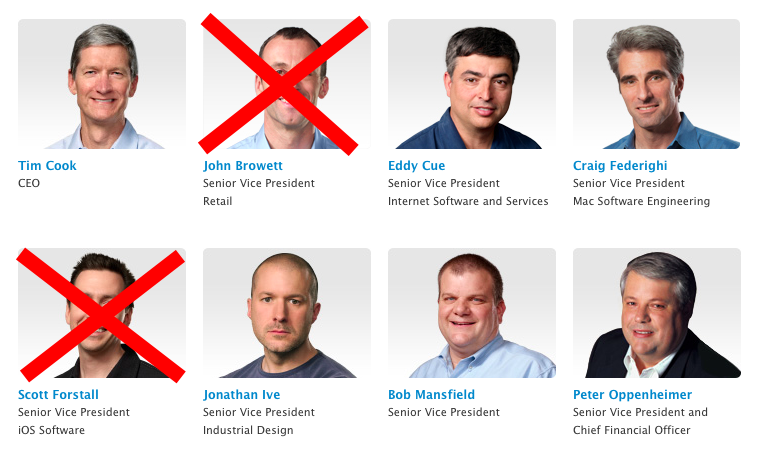 Notably, Browett was hired only ten months ago, but he's been criticized for many of his recent decisions in Apple's retail operations. The focus of the statement is, in fact, a tighter integration of hardware, software, and services. Inside Apple, tension has brewed for years over the issue. Apple iOS SVP Scott Forstall is said to push for skeuomorphic design, while industrial designer Jony Ive and other Apple higher-ups are said to oppose the direction. "You could tell who did the product based on how much glitz was in the UI," says one source intimately familiar with Apple’s design process. I’ve heard much the same. There is an internal political divide regarding these skeuomorphic interfaces. Some former associates of Forstall, none of whom would comment on the record for fear of alienating Apple, say he routinely takes credit for collaborative successes, deflects blame for mistakes, and is maddeningly political. They say he has such a fraught relationship with other members of the executive team—including lead designer Jony Ive and Mac hardware chief Bob Mansfield—that they avoid meetings with him unless Tim Cook is present. Recently, Apple decided to fly the entire design team to the UK to receive the prestigious D&AD award; front and center in the photos of the event, Jony Ive. Interesting tweets about changes at Apple.